There are several ferries per day from Hong Kong International Airport, HKMacau Ferry Terminal (Hong Kong Island, Hong Kong), and China Ferry Terminal (Kowloon, Hong Kong) arriving at the Zhuhai Jiuzhou Ferry Terminal. There is a taxi rank and bus stops directly outside. Visas can be purchased for here for most nationalities (not American citizens). Please visit www.cksp.com.hk for the latest information. 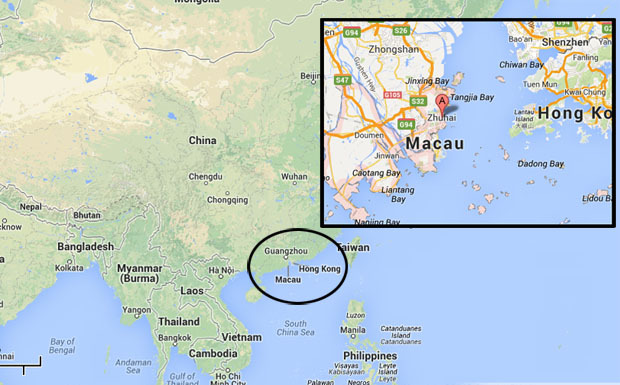 You can walk across the border from Macau at Gongbei. The border is open 7:00 am - 12:00 midnight.